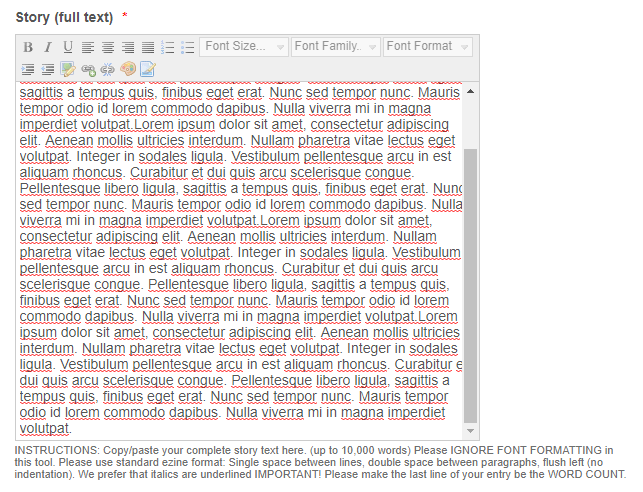 Have several story submission forms, basically the same, with the "long text entry" option in "Rich Text Mode". Stories are 10,000 words. This long text field does NOT scroll in "Rich Text" (as it does with "Plain Text" option). However, THIS Form (your help form) that I am using to submit for help, DOES HAVE THE SCROLL and seems a cleaner - How can I use THIS form element? Below is link for the forms we are using. 1. Using CSS - I'm currently fiddling around with the CSS needed to automatically show the vertical scrollbar and will get back to you as soon as I have it ready. 2. Or, you can use a better field. Both the CKEDITOR and the TINYMCE widgets work in a similar way as a rich text field, but these fields automatically have the vertical scrollbar for longer content. I'll get back to you with the CSS codes whether I'm successful or not. For the time being, try checking out those two widgets that I mentioned and decide whether you'll use them or if you'll stick to using the Long Text Entry field with Rich Text enabled. Thank you for your prompt reply and elegant fix - you people are awesome!